On vacation?? Need a bicycle to ride?? Call Rich about ADULT HYBRID bicycle rentals. The hybrid rentals are Fuji Crosstown 2.3 2016 7 speed bikes. Road bikes with carbon forks. Free delivery and pick-up for 2 bike rentals or advance reservation weekly rentals. Rich's Bike Fit - a bike that is sized and adjusted to fit you comfortably. Headlight and taillight are supplied with a 24 hour + rental if the renter plans on riding at night. It is a state law (and a smart idea) to have lights at night time in the state of Florida. Helmets are included with bicycle rental - Rich wants you to come back safe and sound! Bike type subject to availability. ADVANCE RESERVATION MUST BE MADE 3 DAYS PRIOR TO RENTAL MAY BE CANCELLED 48 HRS PRIOR TO RENTAL FOR FULL REFUND. DISCOUNT RATES MAY NOT BE AVAILABLE DURING HOLIDAYS AND SPECIAL EVENTS. PLEASE PHONE FOR BLACKOUT DATES AND RESERVATIONS. 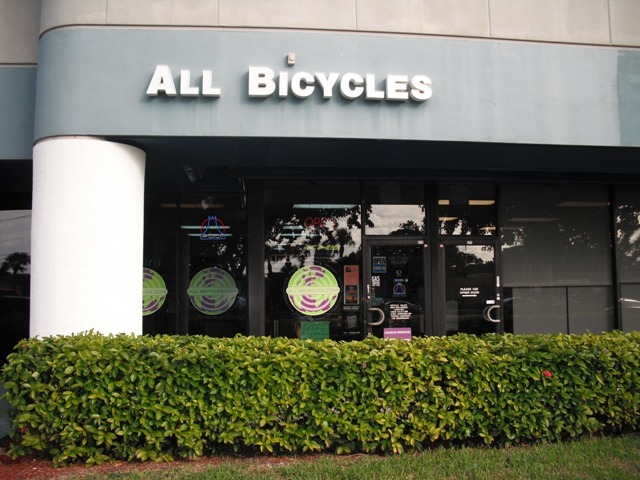 Give Rich a call at (954) 428-2683, send him an email: rich@allbicycles.com or use the Contact Form to get in touch with Rich at All Bicycles and set up your rental today!